Incredible 2 is Out of Stock at Verizon, Incredible 4G Incoming? 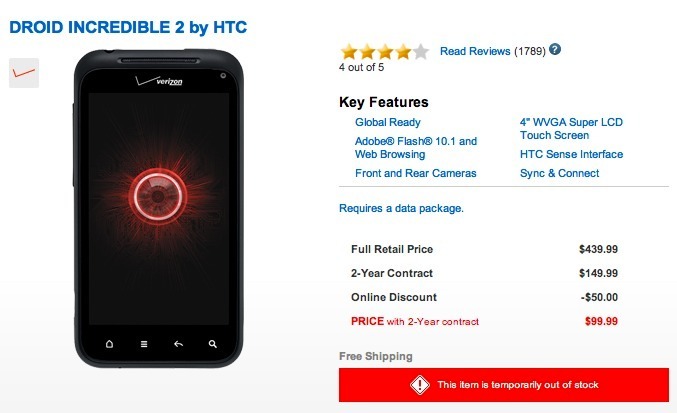 The Incredible 2 is now listed as “out of stock” at Verizon’s online store. While it does say “temporarily,” the device has been out for a year now and as we all know, has a successor on the way. Is this a sign that the Incredible 4G will be here any minute? We are sort of expecting it to drop at any time now that the device, in a finalized looking state has surfaced thanks to one of our tipsters (more pics here). Previously seen targeted dates had it pegged for an April 26 launch, which would be next week, but here we are on the 19th without a peep from Big Red or HTC. As we all know by now thanks to Bionic and Galaxy Nexus drama sagas, these “unofficial” dates, even if from within Verizon walls mean almost nothing until the press release arrives. The Incredible 4G is expected to be the “DROID” version (LTE, NFC, and expandable storage) of the HTC One S which we reviewed yesterday. It should be a solid device for those in the market for an upgrade this Spring.